One could say it has been a tough year for the RBHS football team. With a roster filled with young and inexperienced talent, the Bruins have had significant difficulty against their adversaries this season. Despite clinching a fiery victory in their previous game against the Helias Crusaders, the team was unable to continue their winning ways against St. Louis University High (SLUH), who trounced RBHS with a final score of 45-7 on the evening of Oct. 8. Before the kickoff senior safety Luke Bley said the team was feeling confident coming off of their previous win against the Crusaders. The complete opposite, however, turned out to be the case. After the game was underway, SLUH scored the first points in the form of a touchdown with 8:03 left in the first quarter. From there, the Billikens continued to establish their offensive dominance on the field, all while keeping RBHS scoreless for the entirety of the first half. Even though it was becoming more and more apparent that RBHS was in for another blowout loss, junior tight end Matt Hall said the team’s morale remained high. In the third quarter, SLUH scored a total of two touchdowns before the Bruins would put up their first and final points on the scoreboard. A crisp throw from sophomore quarterback Marcus Manuel resulted in a 23-yard touchdown by Hall; it was a vibrant moment for RBHS in an otherwise dreary matchup. While the Bruins saw Hall’s touchdown as an opportunity to revitalize the team, SLUH quickly responded with yet another touchdown, evening out the score 38-7. 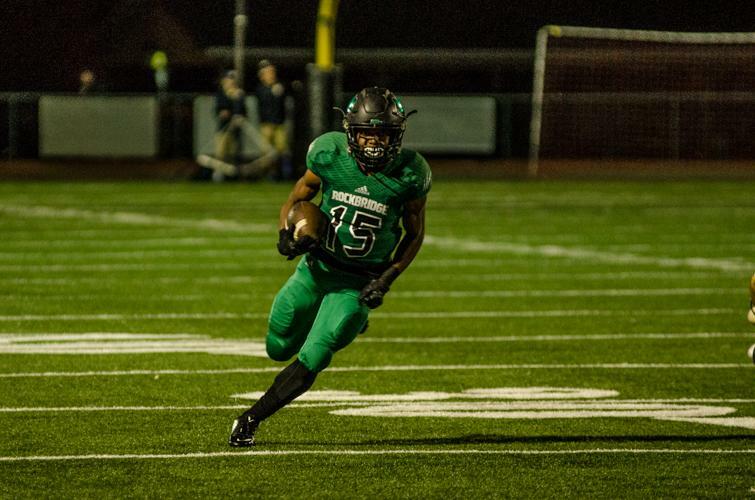 They would score one more in the fourth to secure a 45-7 thrashing of Rock Bridge. “I’m not really sure what made them so effective on defense, but I know on offense they had great [running] backs who were fast and ran hard, and we really struggled getting them to the ground in the second half,” Bley said. Despite the loss, the sixth of the season for RBHS, Hall believes the team will use it as an opportunity to improve for their next game at home vs. Francis Howell. That game will mark the senior night for the Bruins and will their final regular season matchup before district play begins Oct. 21. Will you attend the team’s final regular season game at home vs. Francis Howell? Let us know in the comments below!